The four regions of sub-Saharan Africa, the Middle East and North Africa, Latin America and the Caribbean, and Asia are at the heart of the challenge posed by migration. Over two-thirds of the world’s refugees, and 92% of the world’s IDPs come from Sub-Saharan Africa, the Middle East and North Africa, Latin America and the Caribbean, and Asia. Migration in sub-Saharan Africa is accelerating and intra-regional. The region is home to nine out of ten of the world’s fastest growing emigrant populations. The civil war in Syria has led over 5 million citizens to flee to neighbouring states: 3.4 million in Turkey, 1 million in Lebanon, 660,000 in Jordan. 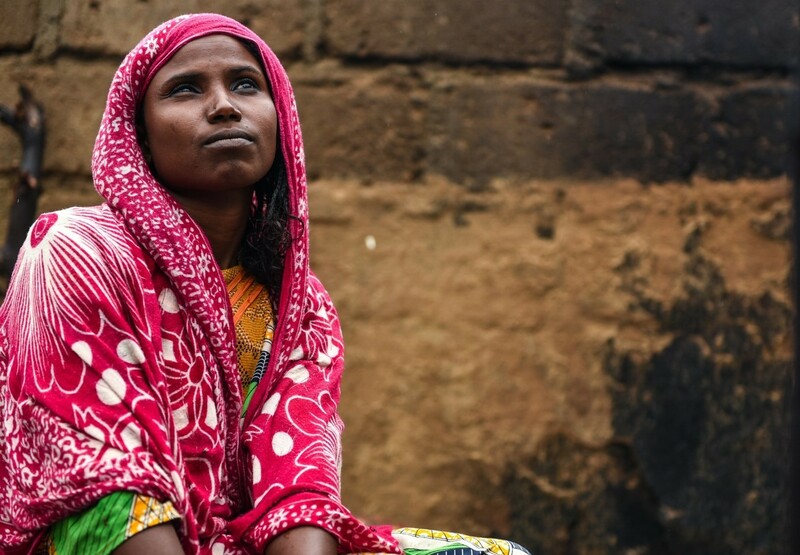 Across the world today, there are more vulnerable migrants on the move than ever before. For far too many, this is a journey of necessity, not of choice. Some are driven from their homes by conflict or persecution, while others are desperate to escape environmental catastrophe or extreme poverty. This issue is fast becoming the humanitarian challenge of our generation. The numbers of forcibly displaced people increased by almost three million in 2017, according to the latest data published by the Office of the United Nations High Commissioner for Refugees (UNHCR). Of the more than 68 million forcibly displaced people, 40 million are displaced within their own countries, and more than 28 million are refugees or seeking refugee status. Children make up more than half of the world’s refugee population, and conservative estimates suggest that around 174,000 of these are unaccompanied, having been separated from their families and facing unimaginable hardship. These are staggering statistics. Not only should they command our attention, they should compel us to act. To date, much of the political and public debate has centred on the impact of this phenomenon on Europe’s developed nations, including the UK. But as this report shows, the vast majority of vulnerable migrants seek—and find—sanctuary within either their country or region of origin. Forced migration is, in other words, a regional phenomenon. This report presents the true picture of this phenomenon. It examines the dynamics of migration within the four regions at the heart of today’s migration crisis: sub-Saharan Africa, the Middle East and North Africa (MENA), Latin America and the Caribbean, and Asia. Between them, these four regions comprise the countries of origin of more than two-thirds of the world’s migrants, over two-thirds of the world’s refugees, and 92% of the world’s Internally Displaced Persons (IDPs). Despite their relevance to the migration debate, the true nature of displacement within each of the four regions is not well-understood. 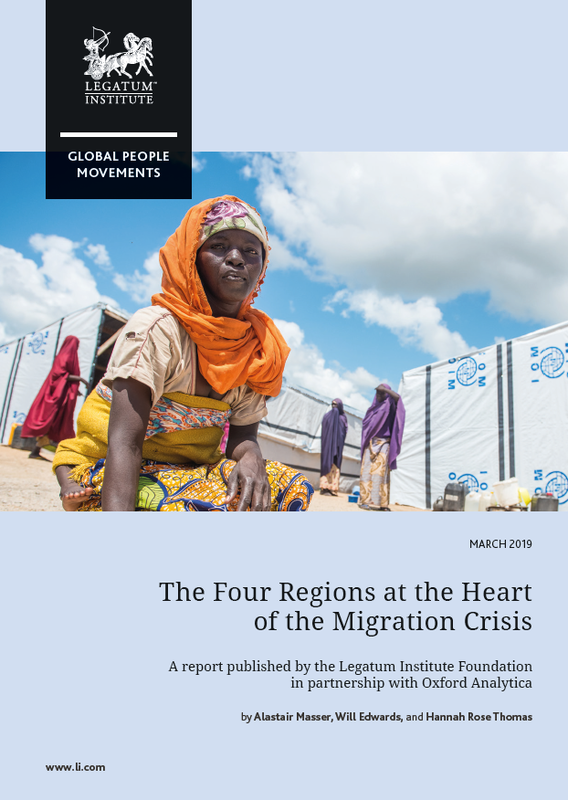 This report, the second in the Legatum Institute’s Global People Movements series, provides a comprehensive analysis of the drivers, individuals, and journeys that shape migration in each of the four regions. 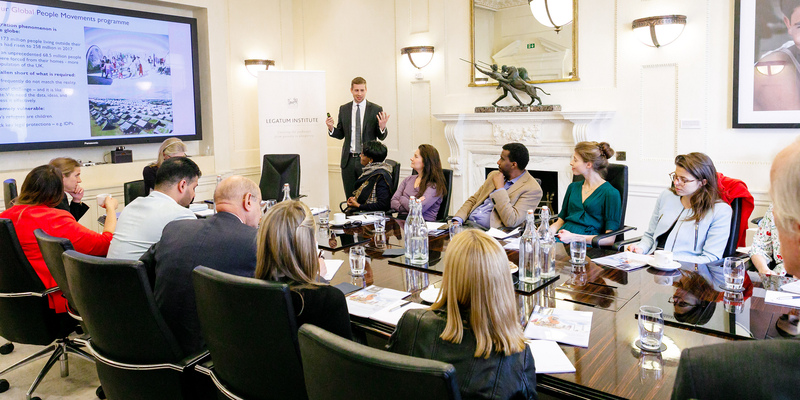 In doing so, it identifies the key trends influencing migration and helps clarify the challenges facing policymakers. The four regions of sub-Saharan Africa, the Middle East and North Africa, Latin America and the Caribbean, and Asia are at the heart of the migration crisis. Between them, they comprise the countries of origin of 68% of the 258 million international migrants worldwide, over two-thirds of the world’s refugees, and 92% of the world’s 38 million Internally Displaced Persons (IDPs). The principle driver of migration by necessity in all regions is insecurity: human, economic and environmental. People fleeing conflict typically seek refugee status in neighbouring countries, but rarely have the means to move on further. The routes used by those trafficking and smuggling migrants are constantly changing, partly in response to new restrictions imposed, which has limited the numbers arriving to Europe through Turkey. An estimated 3% of sub-Saharan Africa’s population lives outside of their country of birth. However, nine out of ten of the world’s fastest growing emigrant populations are from sub-Saharan African countries. The region hosts around a third of the world’s refugees. This is a higher proportion of refugees than any other region in the world. Most stay within the region, with countries such as Ethiopia, Sudan and Uganda among the world’s top ten refugee hosts in 2017. Children account for one in two of sub-Saharan African refugees. 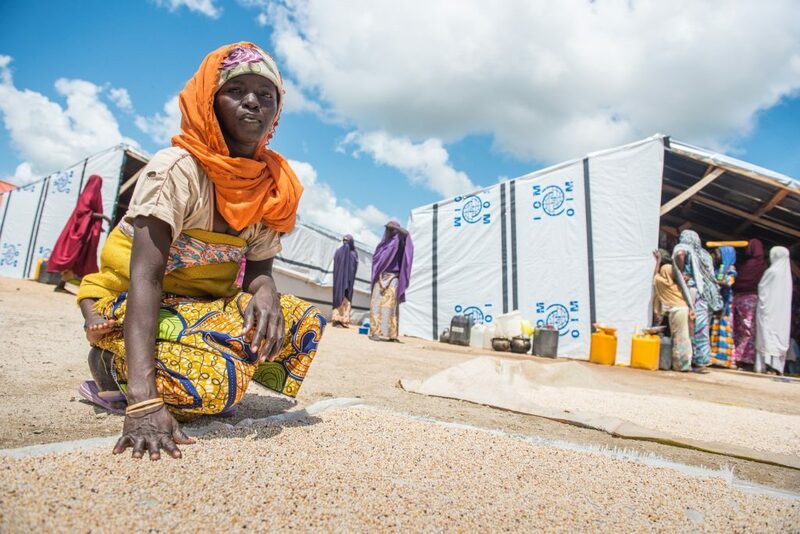 Sub-Saharan Africa is host to the world’s highest number of IDPs, with 12.9 million people displaced within their own countries. Nowhere is this more apparent than the Democratic Republic of Congo, where the number of IDPs doubled in 2017. 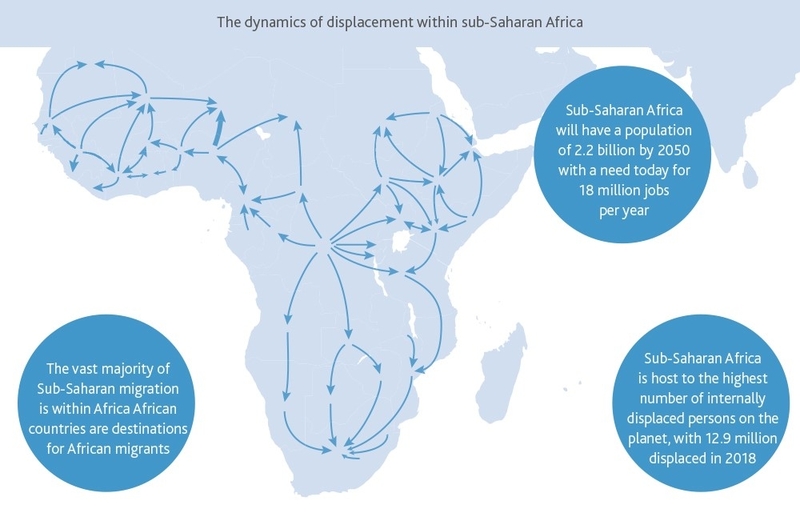 Intra-regional flows define migratory movement in sub-Saharan Africa. 70% of migratory movements in West Africa are linked to employment opportunities within the sub-region. In the Middle East and North Africa (MENA), migration is largely conflict-driven with profound implications for nations bordering conflict zones. The civil war in Syria has led over 5 million citizens of Syria fleeing to neighbouring states: there are now 3.46 million in Turkey, 950,000 million in Lebanon, 670,000 in Jordan, 250,000 in Iraq, along with an additional 130,000 in Egypt. Turkey is host to nearly 5 million migrants, and the country hosts the largest refugee population in the world. MENA nations have emerged as one of the three main transit points for irregular migration into Europe. The Gulf nations are the main destination countries in the region, relying largely on South Asian low-skilled labour. Drivers of migration in Latin America and the Caribbean (LAC) vary considerably, prompted by a combination of economic insecurity, rising crime and political instability, and environmental pressures. Almost 39 million international migrants come from LAC countries. Despite the region accounting for less than 10% of the world’s population, labour migrants originating from LAC make up 27% of the global total. Economic and political downturn in Venezuela is forcing millions across borders. So far it’s seen a 3 million strong outflow. Crime is a prevalent factor in migration, with over 50% of crime victims in El Salvador and Honduras saying that they intended to leave the country, according to one survey in 2016/7. In 2017, an estimated 2.7 million people were newly displaced by natural disasters in the region. Necessity-driven migration in Asia is disproportionately driven by environmental pressures in comparison to other regions. In 2015, Asia’s 16.2 million internal displacements from natural disasters accounted for 85% of the worldwide total. While conflict created 1.3 million new displacements in 2017, natural disasters created nearly nine times as many at 11.4 million. The World Bank warns that by 2050, 40 million people in South Asia could be forced to move within their own countries to escape slow-onset environmental pressures. Asia is both a region of origin and destination for vast numbers of economic migrants. India leads the region as a country of origin with 16.6 international migrants. China has 9.7 million, Bangladesh 7.4 million, Pakistan 5.8 million, and the Philippines 5.7 million.